The bank lost out on fairly meaningful quantum of fees from point of sale terminals and ATM usage during the demonetisation exercise. Private sector HDFC Bank on Tuesday reported its lowest-ever quarterly profit growth at 15 per cent at Rs 3,865.3 crore for the December quarter, pulled down by a margin compression following the note-ban and foreign currency deposit redemptions. Mumbai-headquartered lender, which had made a name for itself by consistently delivering 30 per cent profit growth for more than 32 quarters without a break till about two years ago, and then slipped to the 20 per cent levels with sluggish economic growth, saw its margins narrowing by 10 bps to 4.10 per cent during the third quarter ended December 31. The Aditya Puri-headed bank also saw redemptions of $3 billion worth of NRI deposits raised under a special window opened by the RBI in 2013 which led to a $2-billion reduction in the foreign currency loan book. HDFC Bank had raised the largest amount through this window. The lender saw a 37 per cent surge in the current and saving account balances which helped the share of the low-cost deposits ratio to 45 per cent after the November 8 demonetisation. It can be noted banks were not able to benefit from the surge fully because of 100 per cent CRR on new deposits till December 8. Deputy managing director Paresh Sukthankar acknowledged this is the slowest profit growth ever for over two decade-old bank but defended it, saying this is because of the external environment, and declined to give any guidance on how it sees the next few quarters. He, however, said the private lender will continue to outgrow the system, and gave out data on both deposits and advances growth where it has achieved this. He said the bank lost out on "fairly meaningful" quantum of fees from point of sale terminals and ATM usage during the demonetisation exercise (Nov 9-Dec 30), but said this is for the benefit of larger good in the long-term. Sukthankar made a plea for a "balance" to be achieved on the merchant discount rates so that those investing in the infrastructure also benefit. But the market lapped the bank counter as they believe the lender did well in a challenging time. In a report, brokerage Emkay Research said the numbers are steady given the uncertainty in the market and noted that the bank could maintain stable asset quality as well. The 19 per cent NII and the 15 per cent net profit growth are in line with their expectations. The bank's domestic credit growth of over 17 per cent was split almost evenly between the retail and wholesale lines and the momentum remains healthy, Sukthankar said. The currency swap exercise affected demand in the two-wheeler and auto segments, he said. Sukthankar said the bank has been piling up liquidity since the June quarter with an eye on the FCNR redemptions and had collected over Rs 20,000 crore (Rs 200 billion) which earned low returns for the bank. The DMD also quipped that if he knew about the decision to ban the high value notes which led to a huge surge in deposits, the bank would not have kept so much of funds aside for the redemptions. The bank's core net interest income grew 17.6 per cent to Rs 8,309 crore (Rs 83.09 billion) in Q3, while other income inched up 9.4 per cent to Rs 2,872.2 crore (Rs 28.72 billion). Despite the huge spurt in electronic transactions, the core fees and commission grew only 10 per cent to Rs 2,206 crore (Rs 22.06 billion). The gross non-performing assets ratio was stable at 1.05 per cent, while total provisions moved up to Rs 715.8 crore (Rs 7.16 billion) from Rs 653.9 crore (Rs 6.54 billion). Sukthankar said the new non-performing assets came from across sectors and the special RBI dispensation not to classify loans under Rs 1 crore as NPAs for non-repayment for the stipulated 90 days had a 0.03-0.04 per cent benefit on the GNPA ratio. The bank bought Rs 3,355 crore (Rs 33.55 billion) home loans originated by it from parent HDFC, he said, adding the policy of buying-back 70 per cent of the originated loans is still in work. Its total capital adequacy stood at 15.9 per cent with the core tier-I at 13.8 per cent. 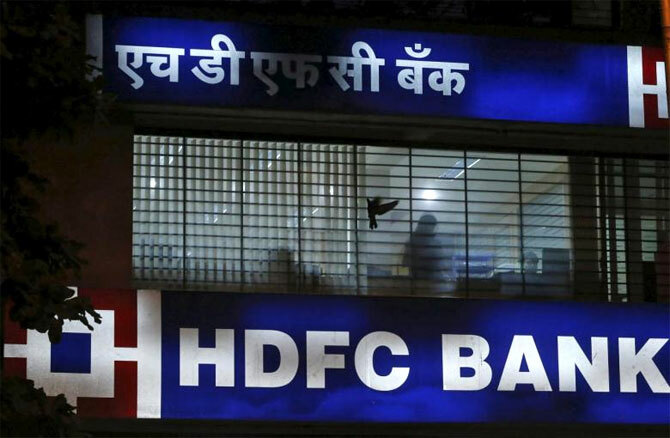 The HDFC Bank counter closed 1.84 per cent up at 1,267.75 on the BSE as against a 0.95 per cent surge in the benchmark.